So what exactly is VENTIS? That’s not an easy thing to describe in a few words, but we will give it our best shot. VENTIS is a cloud-based Academic and Clinical Management platform that has been developed over the past 13 years, with significant input from two well-known Canadian universities, Western University in London, Ontario (formerly UWO) and the University of Manitoba in Winnipeg, Manitoba. It all started in 2005 when the Department of Anesthesia and Perioperative Medicine at Western University needed assistance with clinical scheduling across three sites (St. Joseph’s Health Care, University Hospital, and Victoria Hospital) of London Health Sciences Centre, London, Ontario (Canada). This clinical scheduling system handled personnel records for all Department staff, staffing requirements for each site, daytime assignments and call assignments for physicians, fellows, residents, students, visitors, nurse practitioners, and anesthesia assistants. This scheduling also included matching physicians and trainees on a daily basis. With great flexibility and reporting, this tool served them well for just over ten years. In 2009, the Department of Anesthesia at the University of Manitoba implemented this same clinical scheduling system across the nine sites that form the Winnipeg Regional Health Authority (WHRA). Here, the system was expanded to accommodate period/block scheduling for residents and fellows, evaluations and assessments based on clinical matches of physicians and trainees, as well as other assessments such as RORP, ITAR, scheduling and assessment of educational events and many others. In late 2012 we began the process of greatly expanding VENTIS and implementing it faculty-wide at the Max Rady College of Medicine, Rady Faculty of Health Sciences, University of Manitoba. This was a significant undertaking that was several years in the making with the first modules going live in March 2014, after 14 months of intense discovery, design, and development. Since that time many more components have been added to VENTIS making it one of the best platforms available anywhere for managing PGME activities, and trainee and faculty for both their academic and clinical lives. One of the most recent and exciting developments has been the addition of scheduling and assessments for the new Competency by Design strategy from the Royal College of Physicians and Surgeons of Canada. VENTIS is comprised of modules, here we will list those with a brief explanation on each one. We will expand on each of these in greater detail, including screenshots, in our weekly blog posts. This module is far more than just a few demographics details. It goes way beyond that to include, primary and secondary roles for faculty, multiple programs for trainees so you can follow them from residency, through fellowships and then to faculty. Also, an area to record exams completed, awards given, and grants received. Information related to Aurora admissions, work permits, liability and licensure insurance, sponsorship details for IMGs, start and end dates for each PGY level. Time off requests, discipline, probation, remediation, and suspension, can also be recorded. This information is recorded for each PGY level/year. There is a courses section to track required courses as indicated by both the PGME and program offices with completion dates and location of training. Tracking of many document types such as medical diploma, criminal record check, child abuse check, verification of training and others. The finance area tracks tuition, trainee stipends, invoicing to outside agencies, etc. 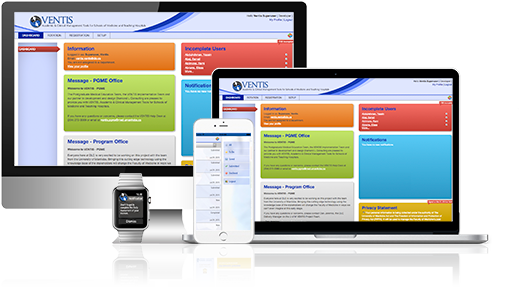 Next, is eForm management, rather than actually passing around pieces of paper for signatures, trainee appointment, program transfer and others are all handled inside VENTIS with digital signatures being recorded as the “document” works its way through the system. There is also a complete email communication system allowing the programs to communicate with the prospective trainee and have them come directly into VENTIS and complete much of the Registration directly. And finally, the Competency By Design and Longitudinal Experience section tracks all the information with relation to these two areas. This section is very in-depth and we will explore that more in a future post where we will zoom in on each of these major modules in detail. In this module, we break down the PGME academic year into 13 periods/blocks, usually 28 days in length. Trainees are given specific rotations during each period and this information is tallied in such a way as to let the schedulers know if these rotations meet the requirements of the trainee as well as ensuring that clinical coverage is given as needed in each department/program. You can also have split rotations which provides the opportunity for 2 week rotations as well as the usual 4 week rotation. This module also has a time off request system where trainees can request time off and it will go through an approval process ensuring that the request does not exceed requirements. Each rotation can be configured to translate into daily assignments which are then used to populate the daily scheduling module. Trainees have access to this area to make time off requests, they can also generate a Royal College report as well as a credit report of rotations completed to date through all PGY years. In this module, all the work in the Rotation Scheduling module comes to life in a daily schedule for all trainees. You can view a daily schedule by Department and/or Program and it will show all trainees with their day time assignments, sites, start and end times as well as Faculty/Trainee matches for the day. Call and Educational Events are also part of this daily view. 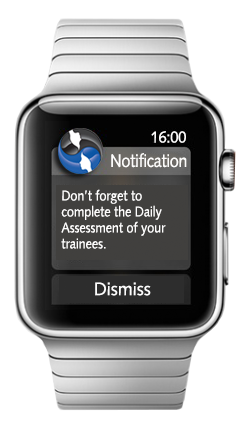 You can also view an individual trainee for a given period of time and see all the same information as the daily view. Trainees can indicate any call requests, there are also call grids, call schedules and Educational (Departmental) events where all events are entered and faculty and trainees are invited. This module is a where all the scheduling comes together. Based on faculty/trainee matches from the scheduling, various assessments are automatically generated and notifications sent to the person needing to complete the assessment. 360s, Clinical Supervision, Educational Events, CPD Events, ITARs, MRAs, Preceptor Feedback, RORPs, Rotation Assessments, Clinical Encounters, etc. There are templates, question banks, so all questions are saved and can be reused, a Likert bank does the same thing. Assessments are designed to be completed on mobile devices, of course, they can also be completed on a desktop as well. Once assessments are completed, there are many reports allowing you to analyze the data. This is a rather significant module and we will dive into this in much greater detail in a future post. This module allows the faculty and trainee to view their calendar directly in VENTIS or on other devices via a calendar subscription or in the mobile web app. This is another significant module where much preparation is done to enable the other modules to function. Departments, Programs, Sub-Specialities, Courses, Calls, Call Schedules, Rotations, Categories and Divisions, Sites, Rooms, and many other important data points that are required. This is the landing page when all users first log into VENTIS. There are 10 – 15 different panels on this Dashboard showing all sorts of information. Notifications, Assessments to complete, privacy and confidentiality statements (signed digitally at the beginning of every academic year by all users), Documents, Wellness, Program Office Messages, etc. It’s a great place to start the day and make sure you are on top of your required activities. The Help module is there to provide guidance on how to use all the aspects of VENTIS. With many, many screenshots, it gives you a great tool to look for the things you’re trying to accomplish and find exactly how to do something. As VENTIS grows and expands, this is constantly updated to remain current. Well, that is VENTIS in a nutshell. If you have a specific area of interest, please send us a note and we will be happy to include that in our weekly blog schedule. If you’re interested in being a contributor, let us know. This is a relatively small community across Canada, any and all information and knowledge sharing is only a good thing that can help everyone. Feel free to share this blog with colleagues in other programs/departments or other universities.